Mary Hendrickson and Doug Constance from Sam Houston State University. Constance is a graduate of … Expand ▸Mary Hendrickson and Doug Constance from Sam Houston State University. Constance is a graduate of the Rural Sociology program at MU and nominated Hendrickson for the award. 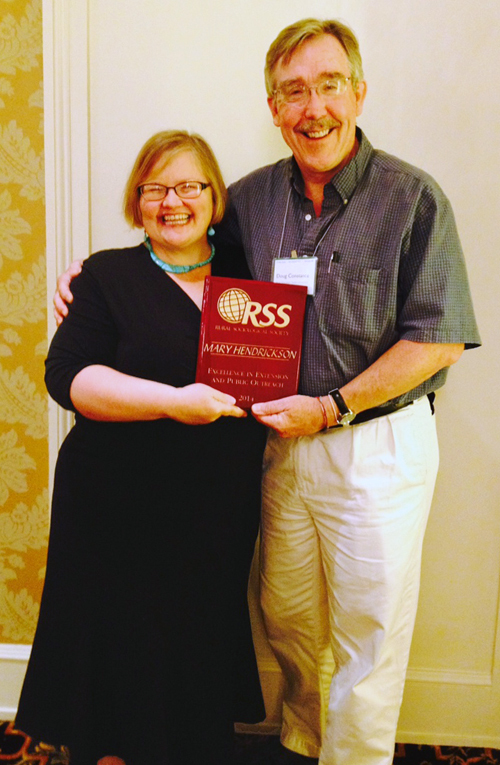 Mary Hendrickson, assistant professor of rural sociology at CAFNR, was awarded the Excellence in Extension and Outreach Award at the Rural Sociological Society (RSS) annual meeting in New Orleans. The RSS is a professional social science association that promotes the generation, application and dissemination of sociological knowledge. The Society seeks to enhance the quality of rural life, communities and the environment. Hendrickson earned her Ph.D. in rural sociology at Mizzou. After completion of her dissertation in 1997, she became director of the MU Food Circles Networking Project in September 1998, and served in that capacity until 2012. During that time, she coordinated an outreach program that linked farmers and consumers in local food systems. In October 2000 she was promoted to extension assistant professor. In 2001 she was named associate director of the Community Food Systems and Sustainable Agriculture Program where she served as state specialist for community food systems and coordinated community food systems and sustainable agriculture programming across the state. In 2008 Hendrickson was promoted to extension associate professor in the Department of Rural Sociology. Since 2000 Hendrickson has given more than 80 presentations in Missouri to farmer, consumer, faith and community groups and more than 80 invited presentations outside Missouri for universities, national and international policymakers, national farmer, faith and consumer organizations, and academic conferences. She has briefed Congressional staff, testified at USDA-DOJ workshops, and given press conferences for the International Assessment of Agriculture Science and Technology. Hendrickson was lead author from North America chosen to participate in the International Assessment of Agriculture Science and Technology.